remember a time when we were living back home. Chip had just confessed to me that he was mentally exhausted from work. He had just finished a tough Monday, which meant he had gone in to clinic around 7 am, started seeing patients around 10 am, finished seeing patients by 7 pm, and was home after 8 pm. He came in to our living room with his scuffed up brown leather shoes and lightweight green jacket still on and sunk into the couch. He looked defeated. Then he said to me "If we actually decide to slow our workload down to travel, I want to focus some of my mental and physical energy on doing good things for others." I knew what he meant, and even though he was in a profession where he helped people all day long, I think he wanted it to be on his own terms and in ways that would not only impact other people, but have a positive impact on himself too. This began our discussion of incorporating random acts of kindness into our everyday lives. A way to cultivate positivity and empathy and pass this lesson on to our boys. At that point we made a pact to try acting on this for a whole year. Think of a time when someone helped you out unexpectedly. Did it leave a lasting impression? Were you thankful? Did you have a better day because of it? Or on the flip side. How amazing do you feel after helping someone else out? So good, right? Nobody loses. Below is our compiled list of random acts of kindness (RAKs, as we call it) that we have been documenting along our journey. A lot of these "acts" are rather simple, we know. We aren't trying to glorify any of them. But whether big or small, some have left a lasting impression already. Day 1: On our way out of town I stopped at Zia (restaurant) for a burrito. I used my gift card to purchase the burrito and there was $8 remaining on the card. I handed it to the person behind me in line and told the fella to enjoy lunch on me. Day 2: Chip helped a fellow Westy driver with coolant issue. Day 3: Pulled up alongside road bikers riding into a 30mph headwind on a remote highway in Kansas and said hello, asked if they needed water, beer, or anything else. Small talk. Did this three different times. It was fun! Day 5: Stumbled upon Cedar Cove, a tiger and big cat sanctuary. They were closed for the day but offered to give us a private tour. We gave a generous donation to the people who volunteer their time and energy. Day 6: Spotted and almost ran over a box turtle in Missouri. Turned the van around and snatched it up off the road (but had to show it off to the boys first), then safely set it on the other side of the road where it was headed. Did this again with a different box turtle at the gas station a few hours later. Day 7: The boys made thank you cards for the Park Rangers at Lake of the Ozarks and then hand delivered them as we were leaving the park. The park rangers loved them! Day 8: Chip helped a lady in the Walmart parking lot by taking back her motorized chair for her. Yes, of course he rode it back! Day 9: Stayed at a Super 8 Motel and the boys delivered a few bucks each to our housekeeper and said "thanks for cleaning our room." Day 10: Made a conscious effort to hold open doors for people at the zoo. Day 11: Organized bikes that had fallen down at a bike rack in town. Day 12: The boys went with grandpa to the nursing home. They brought suckers to the residents (their idea entirely) and handed them out to them. Day 13: Chip spent a day at his grandma's house making kuchen and checking things off her to-do list. Day 14: We had the most wonderful server at the Olive Garden (hate if you want). We complimented him and gave him a generous tip. Day 15: Made dinner for family (16 people). Day 16: Baked "Spudcookies" for fam and upcoming people who are hosting us. Day 17: Reid wanted to give his Strider to Penelope (cousin). Day 18: Bought groceries for a family. Day 19: On a run, someone's mailbox was broken so I quickly fixed it. Day 20: Did a friend's dishes and picked up their living room. Day 21: Chip surprised the boys' godparents by contacting their church ahead of time and getting the boys baptized at the Sunday morning church service. Day 22: Helped a mom and their two kids put up their tent in the pouring rain at a Michigan campground. Day 23: Left money in an envelope for someone to enjoy a hot shower at Forest Pond Campground. Day 24: Timed a guy at the track who wanted to see how fast he could run a mile. Day 25: Bought groceries for a friend. Day 26: Chip spent the day "car shopping" with a family member. And then he did it again the next day. Day 27: Made a donation to Oxbow Park (Zoo), where I grew up going. Day 28: Sent a friend a present in the mail. Day 29: Made a huge donation of kitchen goods to Goodwill. Day 30: Visited the nursing home to see grandma. 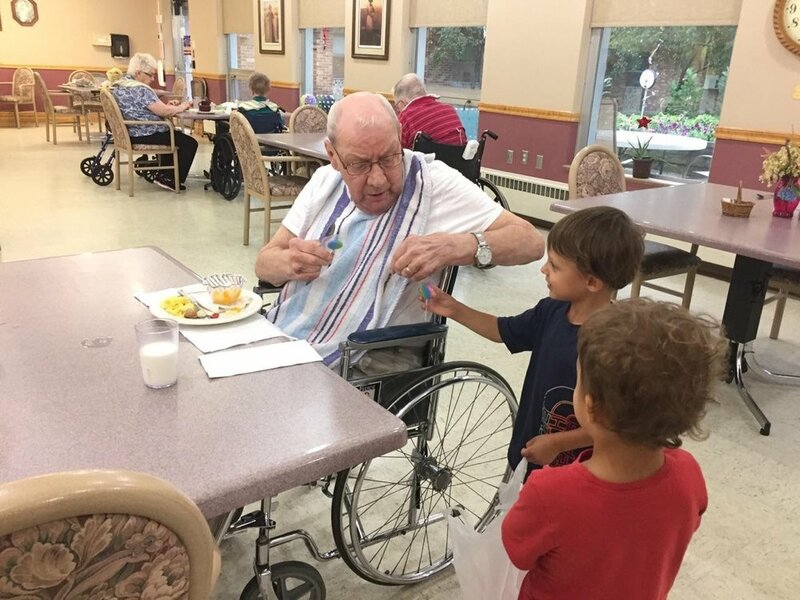 The boys handed out suckers to the residents who finished their lunch! It was adorable! Day 31: Helped mom de-clutter her kitchen. Got rid of boxes of unused cookery. Day 32: Older woman spilled her drink on the ground at the restaurant. Helped her clean it up and made a joke about how we are usually the family that spills things. Chip went and alerted the workers. Day 33: The boys handed out their stash of ice cream sandwiches to our campsite neighbors. They loved them! Day 34: Followed a driver that was swerving on the highway. Called it in to the police. Day 35: Chip convinced an older woman who was losing her cool to cliff jump - he jumped with her! Day 36: Found someone's clothing article in the laundry machine at the campground. Found the gentleman and gave it back to him. Day 37: Mailed letters out to friends. Day 38: Picked up hitchhikers in Yellowstone (twice!). They fit nicely on the floor while the boys told them stories about Old Faithful (which we had just seen). Day 39: Donated canned goods at a food drive in the grocery store. Day 40: Took time to talk to the housekeeper at our hotel. Other workers rolled their eyes as they walked passed, but I kept listening to him. Day 41: Stayed with friends, made dinner for them. Day 42: Drove a friend's truck and raft trailer for them so they could raft an extra day. Day 43: Boys held the door open for an older man without being prompted! Day 44: Offered to take pictures for a family in Tetons. They ended up being from Minnesota, and near my home town. Day 45: Gratitude blog post went live to acknowledge all the people we stayed with in the Midwest. Day 46: Hiking on Avalanche Trail hike. We (including the boys) said "hi" and "good morning" to every single hiker we passed (and this was an extremely busy trail!). Lost count at 70 and we had only gone one way! Day 47: Teedo donated $10 to Glacier. Thanks for doing a RAK! Day 48: Ran into Westy people who liked something we had in our van, so we gave them our spare. Day 49: Saw a grandfather, father, and son setting up their camera to take a timer picture, but I ran over and offered to take some photos of them instead. They returned the favor to us! Day 50: Put quarters out at the laundry machine for someone to use. Day 51: Reid offered his truck to a boy with no toys at our campground. Day 52: At a camping event for Westfalias, the boys offered to take people's trash to the trash bin. They took eight different trash bag loads. Day 53: Left a note for some awesome people we befriended at the Belly River campsite who were leaving for home. Day 54: Made popcorn for our German pals at the campground who were playing a board game. Day 55: Reid offered thimble caps (berries) to other hikers on the trail. Day 56: There was no TP in the bathroom, so I offered some wet wipes I had to an older lady. She was thrilled! Day 57: A young guy in Nelson started living in his van a month ago. He was a sweet guy. He mentioned his dog chewed up his fan so we gave him our spare. Day 58: Cute kid at our campground - we gave him our camp chair and a frisbee to keep. Day 59: Found blackberries, picked them for our driveway camp hosts and for the campground host, Debbie. Day 60: Made a Hurricane Harvey donation. Day 61: New friends we met announced they were newly pregnant so I gave them a little present. Day 62: Gave our Canada Park's Pass to someone who was going to be visiting Canada soon. Day 63: Biker's light fell off their bike. We went back to get it and return it to them. Day 64: Let a couple driveway camp at our vacation rental in Washington. Day 65: Sent a take-out meal to a friend who just had a baby. Our friend group uses Meal Train to organize giving meals to friend's in a time of need. Day 66: Made a donation to a classroom in Durango on www.donorschoose.org. This website is great for making local donations to help support your community. Day 67: Mailed out letters to friends. Day 68: Chip stayed back with a friend's dog so they could go for a hike in a no-dog zone. Day 69: Asked another mother if she needed help at the YMCA - Sat with her baby while she got her toddler out of swimming lessons and grab her things from the daycare. Day 70: Sent a gift to a friend's daughter. Day 71: Chip stopped to help three women that had a flat tire AND a flat donut tire. We took the tire and lady to the shop, waited for the new tire, then took her back to her car. Chip changed out the tire and she was back on the road in an hour. Day 72: Picked up toilet paper (eww) and plastic bottles at a backcountry campsite. Day 73: Was watching a beautiful sunset so I took a few photos of a small family walking along the beach. I lost the courage to go talk to them. But about ten minutes later they walked back and I ran down and mentioned the photo. They were thrilled and asked that I text it to them. Day 74: Chip saw our camp-neighbors struggling to start a fire. He offered our axe and helped them. Day 75: Signed up for the Beverly Beach clean-up. Picked up trash along the beach. Day 76: The boys made a donation to the Tillamook National Forest Visitor's Center. Now THAT is a cool visitor's center. Day 77: Saw a cute fam at the beach with their pup. The daughter left her shoes on the bench near us so we slipped $ into them for fun. Day 78: Sent a care package to niece, who just started nursing school. Day 79: Wrote a letter of encouragement to a stranger who needed it. More Love Letters has a list of people who could benefit from a hand-written letter, nominated by a friend or family member. If you haven't been on this website, check it out! It's pretty cool. Day 80: Chip was chatting with a lady in line at the store. She noticed she didn't have cash or her credit card. 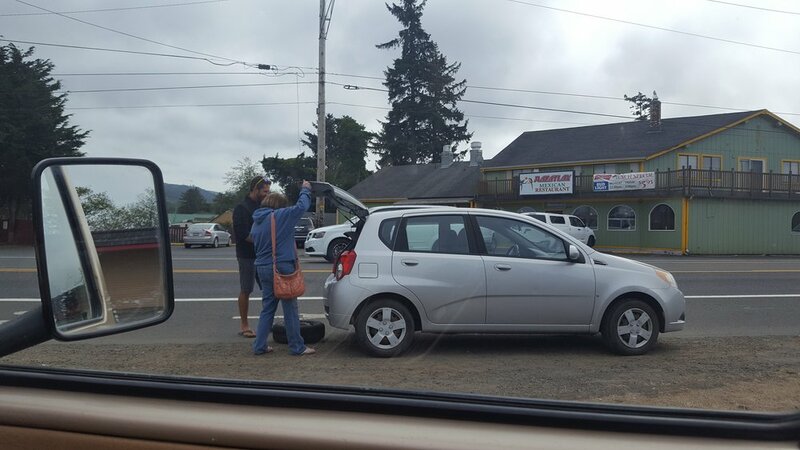 He offered to pay for her things so she didn't have to get out of line and go get money from her husband. She re-paid the money and gave us an apple. Day 81: Bennett picked up someone's coffee cup off a rock at the beach and brought it to the garbage can. Day 82: Made Spud cutout cookies for a van meet up. Day 83: A grandma fell down at the park. She hurt her hip pretty bad. Chatted with her (called "mimi" like ours), and she was visiting her grandchildren in Bend. We kept an eye on her granddaughter while she rested for a few minutes on the bench. Day 84: Planted trees in the forest at Descend on Bend. Day 85: Wrote a note and gave our kite to our camp neighbors at Descend on Bend. The daughter really loved flying it with Chip. Day 86: Helped push a van out of the dirt. Day 87: Gave a journal/pen to a new friend we just met who likes to journal. Day 88: Made a donation to Shore Acres Botanical Gardens (Oregon). This place was awesome! 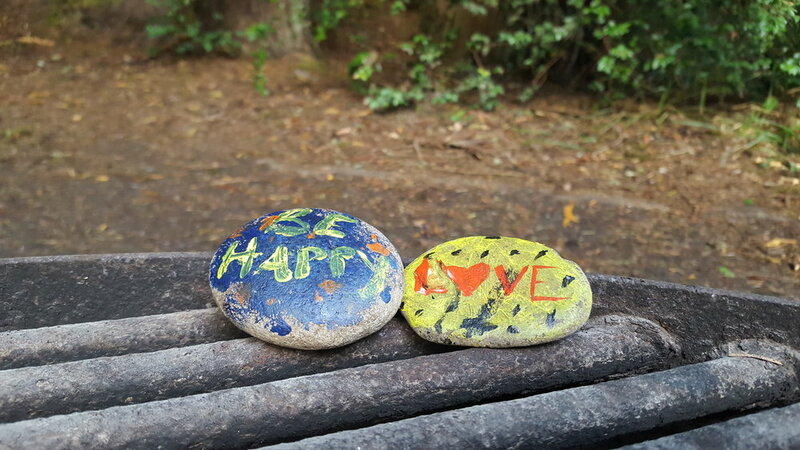 Day 89: The boys painted rocks at our campsite and we left them for the next campers. Day 90: Wrote a personal note to the Samaritan Ministries recipient for our health insurance. Day 91: Had two coins from the scavenger hunt at DoB so gave one to our camp-neighbor so she could redeem it for a HydroFlask water bottle. Day 92: Left a bundle of campfire wood at our campsite for the next campers. Day 93: Made a donation to Make-A-Wish. Day 94: The car in front of us lost their hubcap while we were driving behind them. We raced to pull up beside them, rolled our window down and let them know. Later, Chip met up with the folks at a beach and went back to try to help them look for it. Day 95: Volunteered at a donation center in Santa Rosa during the wildfires. Day 96: We gave our kid camp chairs to our camp neighbors that have kids. Day 97: Sent some Canadian souvenirs to friends. Day 98: The boys painted a rock at Lumsden campground and we wrote "All You Need Is Love" on it. Day 99: Chopped and left a pile of campwood for the next campers at Lumsden. Day 100: Pulled over on the highway to help a car with their flashers on. Day 101: Outside the grocery store, a man was playing the accordion. Instead of money, Reid gave him an apple. Day 102: A lost dog strolled into our campsite at Alabama Hills. Neighbors mentioned they had seen him but didn't know either. There was barely any reception but we shot a text to the number on the dog tag. Knowing the owner might not receive the message, Chip headed out to try to find him. He showed up 30 minutes later with no dog, and said the two were happily reunited. Day 103: Ordered a take out meal to a friend who just had a baby. Day 104: Wrote a note of appreciation to two good friends back home that are making positive impacts in our community. Day 105: Participated in the San Luis Obispo Food Drive at Grocery Outlet. Day 106: Gave to a memorial fund at our local church. Day 107: Opened our campsite to share with another camping family. Day 108: Offered to help another mother on the beach who was carrying a baby in a baby carrier and two oversized bags. Day 109: Checked in with a friend back home via text messages. Day 110: Mailed a care package to a friend that just had a baby. Day 111: Left an envelope of coins at the laundromat for someone to find. Day 112: Cleaned, vaccuumed, swept, and dusted a friend's house as a way to say thanks for letting us stay with them. Day 113: Learned of some very sad news within our Durango community so reached out to friends that were affected and sent a note letting them know I was thinking about them. Day 114: Spouse RAK! Chip made a hair appointment for me, dropped me off and picked me up. Day 118: Gave a man oranges who asked for money. Day 119: A ladies cart froze outside the store so I offered to wait with it so she could run and get her car. Day 126: Gave a bag of clementines to someone in the airport. Day 127: Colored a picture and gave it to a random lady in the airplane. She reminded us of mimi. Days 129-134 - 12 days of letter writing. Day 164: Offered to help a man with his luggage. Day 171: Gave an orange to a homeless guy. Day 178: The boys collected shells on the beach and went around the campground talking to people and passing them out. Day 183-184: Reid and B offered their bikes and dump trucks to a Russian boy and played with him for an entire afternoon and evening. When he fell and hurt himself they ran over and asked if he was ok. When he left the next day, they gave him hugs. All without prompting. Day 193: Found a girls school ID on the ground. Brought to office and turned in. Day 215: Woman lost phone in store. We kept calling until she found it. Day 216: Asked a grandmother if she had any grandkids who needed a bike. Gave Reid's bike to her. Day 217: Paid for family's lunch. Day 221: A camper was walking out of the campground, said there were no sites. We offered to share ours. Day 234: Assisted lady with bins at airport. Day 235: Older man in wheelchair dropped something on ground. Got out of line to help him pick it up. Day 236: Woman and kids left their airplane pillows on their seats as they went to board. I ran over and gave them to her. Day 237: Woman in plane was asking for a hairtie. I gave her mine. Day 240: Ran over and helped an older woman who had fallen off her bike. Stayed with her until she felt ok.
Day 242: A young girl with bike was crying. I went over to her and asked what was wrong. She said she was from Paris and lost her school group. I helped her find her way back to the bike return. Day 243: Took my mom to Ireland for mothers day, a bucket list place for her. Day 245: Had an awesome, helpful, patient and nice worker at hot head burritos in Toledo. After we are we went back in and asked for him. Told him what a great job he did and gave him 5 bucks. Day 246: Offered to get the bride a drink at a wedding. Day 247: Reid ushered and handed out bulletins at church. Day 289: When ordering take out, refused plastic utensils and straws with our food. Day 291: Bought a "cup of Joe for a Joe" through Green Beans Coffee. For only $2.50 you can thank a member of the armed forces for their service with a hot, fresh cup of Green Beans Coffee and a personal message. RAK 292: Donated to Project Hawaii - Helps homeless Hawaiian children return to school in fall and helps provide meals, supplies, etc to them.